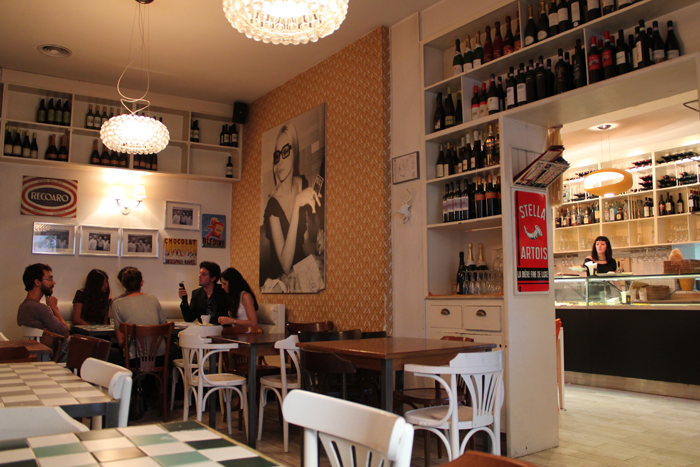 When I am in Rome, one of my favourite places for a weekend breakfast is Necci. This place – a bar, restaurant, pastry shop, bakery and wine cellar – is located in a neighborhood that in recent years has become one of the trendiest in the Roman suburb of Pigneto! It is favoured by young artists and the capital’s radical chic crowd. Its pedestrian area is full of people from aperitif time until very late at night. Necci – located on the opposite side of the pedestrian area, beside the new metro C – is an historic place in Rome. In the past, it had the honour of appearing in a film made by the great Pasolini (with Bertolucci as assistant director). This is why it is one of the places that all cinema addicts absolutely must visit! In the Necci restaurant you can breathe a totally different atmosphere, depending on the time of day when you visit: on a weekday morning, the tables are often occupied by elderly members of the community who go there to play cards. From aperitif time onwards, however, – or at the weekends – the restaurant is full of young people. The restaurant has been lovingly restored but it still retains a vintage style which makes it very cosy and informal at any time of day or night. I have also tasted their quiche and their small sandwich with tomato and mozzarella. They were both good. The breakfast is self-service: choose the food, pay and bring it to your table. Where to eat in Rome as the Romans do. Click here for the list of places!